Toner InkExpress - Woodland Hills, CA, United States by Armando S.
Love it by Armando S.
Your trust is our top concern, so businesses can't pay to alter or remove their reviews. Learn more. Oh my! We found this place by chance and found out they have AWESOME prices on ink! Instead of spending $30- at Staples for a single black cartridge (my Epson drinks ink...) I found them at Toner InkExpress for $9! I think the prices vary per type of cartridge, so please call ahead and they'll help you price yours. The techs there are also very cool, I found out that my Epson drinks so much ink because it does 3 passes over each page to print...and that I should change my settings to conserve some. Nice tip! Print on, my friend-but get your ink here! Crazy inkjet is by far the greatest and lowest priced printer ink store hands down! They actually have a factory in chatsworth where they manufacture the cartridges witch is how they can offer such low prices. The cost is always at least half the price of any major office supply chain, I have saved so much money thanks to them. The staff is extremely helpful in not only finding the proper cartridge I need and they also suggested some print settings that make the ink last twice as long! I was so impressed I gave them my email and on major holidays they send me coupons for 12% off the already super low price, does it get any better! Super awesome staff. Always available for my last minute ink supply. Reasonably priced with amazing customer service. My go to ink shop! I Googled "where to buy Ink for your printer" I called in to make sure they had the ink that I needed for my HP Photosmart estation printer, my printer is still fairly brand new however you never know, I certainly didn't want to waste the drive over. Nev answered the phone and was so patient with me answering all of my stupid questions. When I arrived at their store he remembered who I was and already had the ink waiting for me, they even gave me a discount for turning in my old cartridges! No lines, no fuss, no muss, in and out in 5 min. Staples who? no more...over price over charged no workers around on the floor to help you...I'm going to Toner InkExpress every time! I called in and asked if they had my ink for my Brother 5250DN. Since my printer is older I wasn't sure if they would have it. They did so I went to the shop. I was greeted and processed. What a great shop, right there in Woodland Hills next to the Ameci's. The owner and his colleague were very friendly and informative. I learned about what is up and coming in the ink/toner world which was very interesting and even about the integrity of my machine that I thought I was ready to replace but not after talking with the shop. They cleaned up my drum and assisted me with the ink. The price was incredible and the service A+. What a great experience. Toner InkExpress are in the know and they're environmentally conscious to boot. The bottom line is these guys are pros and it shows through their business. I will never go anywhere else to get my ink & toner. After finding Toner InkExpress, Staples should be ashamed of themselves. Thanks Toner InkExpress, my printer is singing. 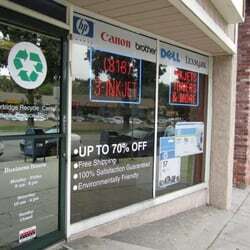 I go here when I need printer cartridge replacements. Good, friendly people, professional service and decent prices. The stuff is always so expensive but they manage to keep the prices relatively low. Go here for all your ink refill needs! I used to go to Costco and Fry's to get my ink refilled, but then stumbled across this place. I will now always go here for my refills. Great prices! Quality ink. Can't beat it! Highly recommend! I live locally and it's always a pleasure to frequent a local business over Amazon or the mega office supplies stores. PLUS, the printer cartridge I needed was $10 less than on line! A double win! I have always felt this was a great place to get ink jets, but I am even happier now, because my printer stopped working right, and I took it in, and they serviced it, and now it's like I have a new machine. Thank you so much. After reading all the other stellar reviews, I drove to check this place out which is conveniently located up the street from my office. It's a cute little store front nuzzled between retailers on south Topanga which I typically don't often frequent. The owner came out and greeted me and was friendly. I only needed a black cart for my Canon all in one which he looked up quickly to make sure I would get the right one. Asked if I needed color to which I replied - "prolly not but since you're so close, I'll come back if I do". He asked if I had any recyclable one's which I forgot to bring. He said he'd honor the discount after the fact, If I brought them in next time. Super friendly, knowledgeable and neighborhood store -- support local business, people!! I have been an IT consultant for many years and yet to meet ANYONE who is as knowledgeable about their product in this over-crowded fly-by-night field, or as concerned about the environment. FANTASTIC pricing, great support, fast delivery!!!!! A great match for anyone who needs ink or toner quickly and on a budget!! I just brought in some old cartridges from my boss' HP printer... not only do they recycle them here, but the new ones you buy are SUPER cheap compared to Staples and other similar stores. Plus, the owner is a really nice guy! I live in Hollywood, walking distance to a Staples, and am seriously going to buy my printer ink here from now on! The owner is loco for providing ink cartridges at "crazy" low prices. I also get my Ream of paper there. Compare prices from Staples, Office Depot, etc., they wont' beat Toner InkExpress. No lines, no hassles & no unfriendly staff. Ask about their Fund raisers for Non-Profits. Toner InkExpress is the best. I Went in there today on my lunch break with a printer problem. A Gentlemen by the name of Yaniv helped me He got it fixed in 10 minutes so i still had time to get lunch for myself and i only had to pay for the new ink cartridge which the price of was super low compared to everyone else The service was great they really care about customers I live in van nuys and i will always now make the trip to make bussiness with this fine company. A nice place and nice people who know what they're doing. Yaniv and Carl are great with the customer service. 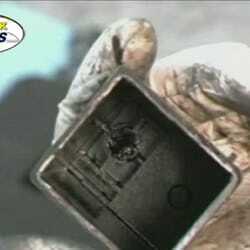 If a cartridge is defective, they'll replace it...no fuss, no muss. Great prices, great service and they stand behind their products. I barely spotted this place on my way home from work one day.. it's sort of in a residential area and not in a big shopping area. But I filed it in the back of my head, since I got sick of spending big bucks at places like Office Depot on name brand inkjet cartridges for my HP printer. I finally went in when I needed a replacement, and they were fantastic. GREAT prices, and very friendly service. I'll definitely be back there again! I have been using Toner InkExpress for a few years now and they have great products and even better service. I had referred them to one of my customers, she ordered her cartridges via mail, got them and didn't know how to install them, the owner, Yaniv drove to her house and showed her how do install them! I have gotten my cartridges over night, hand delivered or at the counter waiting for me when I said I will come get them. What really impressed me is that a customer of mind called them and he told them for what they needed to do print wise that they were better off getting brand name cartridges. His honesty sold me for life! Interesting name, really relates to nothing this business is about except the Ink they sell, nothing crazy except their wonderful prices. Not only great prices but really helpful, intuitive service. After they sold me the ink the guy asked if I knew how to put it in and then told me how. I was of course a little dense and couldn't find the right place to open on my printer. So I brought it in and without a word the guy started putting it in. The world needs more places and service like this. Stop looking for a place to get printer supplies. This is it. I've been a customer for many years and have always gotten good service. Recently, I had a printer cartridge problem and they took every possible way to find a solution. They went 'above and beyond.' As far as I'm concerned, this is the place to get your cartridges and for a great price. Thanks, Crazy Ink Jets! I have been using their toner cartridges for almost a year. I was referred to this company by my brother in law who is an attorney. Out of all the cartridges I have purchase, only one was defective. When I returned it, it was cheerfully exchanged. This company personified INCREDIBLE CUSTOMER SERVICE! I went over today to purchase two cartridges and they were paving the street making it impossible for me to have access to the store. I parked across the street at the local Starbucks, called the store and the associate came over with my order and I paid by check! This is what I call incredible customer service! I read all the reviews and have to add my own. Yes, the shop is nestled between other small retailers but it's very accessible. The owner is delightful and again, he is very businesslike and knowledgeable. I have been buying my ink jet cartridges for a while and yes, they re-cycle your old ones and give you a refund on your new cartridges. The shop is spotless and very well organized. I don't bother going anywhere else for my cartridges now. Their prices are reasonable and I enjoy going there. Thank you. Sonia F.
While there are many chain stores that sell refill of printer cartridges this business sells re-manufactured cartridges. I have had smudged ink from the chain store refills but no blemishes using their product at least twice for my 8 year old HP Office jet 6110 printer. Besides the obvious cost saving you can realize, Yaniv and his team have very good customer service skills. When I did have a problem with a printer error they replaced the cartridge I had purchased without any questions (and of course the replacement worked). I was even provided with suggestions on how to extend the life of the cartridge. Now that's what I call a Better Business! The best place to buy ink, hands down. The staff are friendly and helpful. You are in and out in 5 minutes, max! Love it. No parking in the area and it is off the beaten track. Yes they are good re-manufactured cartilages, but I've found new ones online cheaper. Toner InkExpress offers discount inkjet and laser toner cartridges at significant savings. 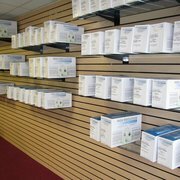 When comparing our prices to those large retail stores, you'll find you can save up to 70% in some cases by using our brand new compatible, or quality remanufactured inkjets. Buying your inkjet and laser toner cartridges from us is an outstanding way to save money each and every time you need more cartridges! Copyright � 2004�2015 Yelp Inc. Yelp, , and related marks are registered trademarks of Yelp. This user has arrived from Qype, a company acquired by Yelp in 2012. We have integrated the two sites to bring you one great local experience. This user has arrived from Restaurant-Kritik.de, a company acquired by Yelp in 2014. We are integrating the two sites to bring you one great local experience. This user has arrived from Cityvox, a company acquired by Yelp in 2014. We are integrating the two sites to bring you one great local experience.